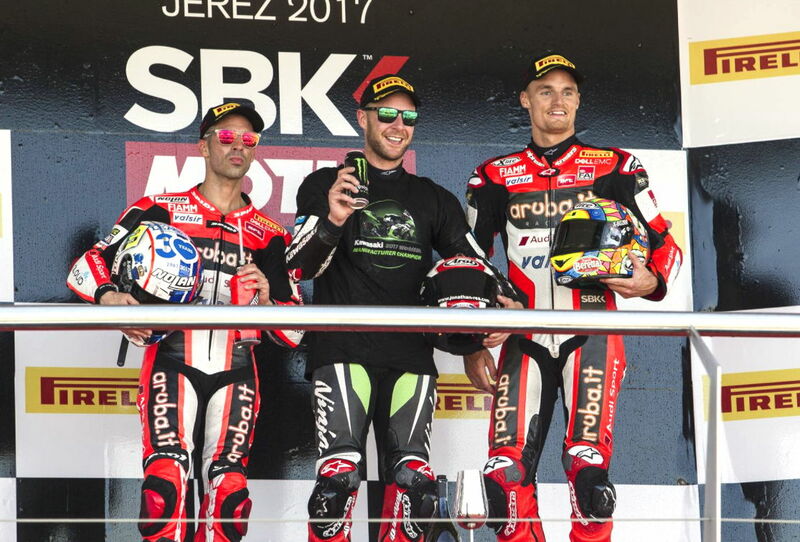 Jonathan Rea (Kawasaki), having already secured this year’s WSB title, took another double win at Jerez this weekend. In the process, Kawasaki has secured the Manufacturer’s championship for 2017, as well. In Race 1, Marco Melandri (Ducati) was leading with four laps remaining when he retired with a mechanical issue. Rea inherited the lead and the win, ahead of second place Chaz Davies (Ducati) and third place Tom Sykes (Kawasaki). In Race 2, Rea quickly made his way through the reversed grid and cruised to the win ahead of second place Melandri and third place Davies. Yea, that would be interesting to see how he faired there. Don’t know how much $ he’s getting paid now where he is. Going to Moto GP may be too big a chance to take since Kawasaki isn’t there too. He’s on top of his mountain right now. Moto GP is a lot more competitive these days currently than it used to be. – John Ray when asked a little over 30 days ago about rumors of him replacing Joe Crazy at Suzuki MotoGP. Rea gets it. So many guys are pining to get to the GP Premier class so bad that they’ll jump at the first kit thrown at them, often spending the rest of their careers as grid fillers. For several years Rea was riding an uncompetitive Honda and getting results the bike didn’t deserve. Now that he has a competitive ride, he’s winning. I guess he’s getting too old to score a MotoGP ride, but would sure love to see him in that class on a competitive bike.